In an early Monday sell-side research note published this morning, cannabis stocks bulls were jarred by a less-than-enthusiastic outlook. 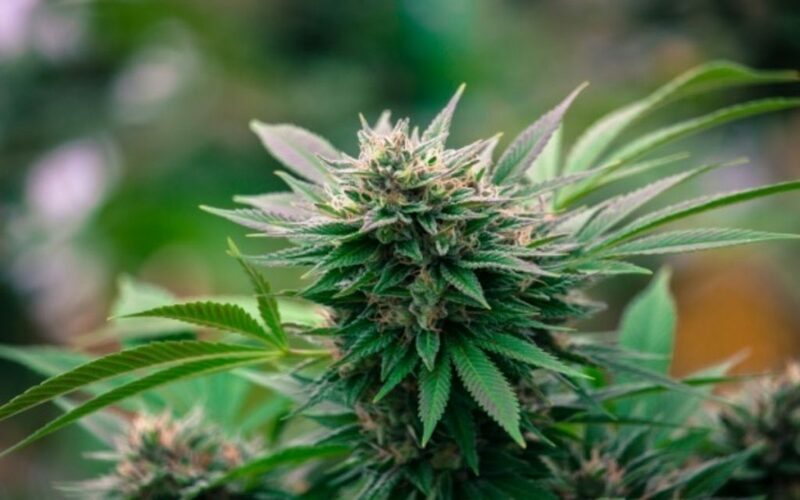 Canadian equity research and investment bank, GMP Securities, issued a quasi-damning report on the revenue side of the legalization equation—news which certainly wasn’t supportive for sentiment change the sector so badly required. With 12 days of cannabis legalization in the rear view, it becomes increasingly clear that recreational cannabis sales in 2018 will be much lower than previously expected…. As a result, we have reduced our recreational cannabis sales expectations for 2018 for most companies under coverage. And with bearish forecast in-hand, traders opted to sell into yet another strong beginning for cannabis stocks. 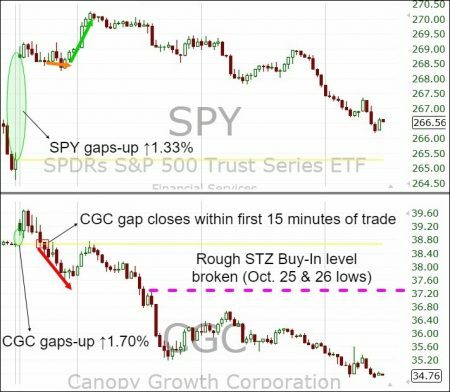 This selling manifested prominently in industry leader, Canopy Growth, as a similar-sized gap-up vis-a-vis CGC and SPY evaporated within minutes on-open. Once price broke below the psychologically-important Constellation Brands rough equity buy-in levels at C$48.60 (October 25 & 26 lows), bullish hopes were dashed early. Naturally, the entire cannabis complex followed. Particularly impacted were the more notable market laggards, such as Aurora Cannabis and Green Organic Dutchman Holdings (TGOD). Both stocks actually gaped-down on the session, refusing to take their cues from the modest exuberance in sector/index pricing. In TGOD’s case, the weakness is particularly notable. That’s because price dropped below its all-time low of $3.50/share, set on May 9th, just days after its IPO-debut on the Toronto Stock Exchange. With tens of millions of retail shares becoming eligible to trade after the 6-month lockup period expires on November 2nd, it remains to be seen how the stock copes with increased supply. Certainly, the steep recent drop in prices should mitigate any potential weakness to some degree; how much is debatable. It’s a narrative Midas Letter will be following closely. On a broad market level, the Horizons Marijuana Life Sciences Index ETF (TSE:HMMJ) has now shed ↓31.78% in value since its October 15th close of $26.05/share. Even recent out-performers like Namaste Technologies and Emerald Health Therapeutics have given up promising bullish rallies. How much today’s GMP Securities note played a hand in today’s continued selling is an open question. But certainly it didn’t help, and likely provided the impetus bottom-picking bullish investors needed to throw in the towel near-term. GMP Securities found, among other things, that brand preference is not major a decision factor among consumers they surveyed. Thus, they believe market capture will be closer to 20% from the 33% originally forecast.